I was talking with one of the readers of my newsletter about the uniqueness of the ending of a chess game. There are many sports that end because of a clock. Football, basketball, and hockey all last a specific period of time. The loser doesn't ever concede defeat; they just run out of time on their comeback. They have a built-in excuse, "If the game was only X minutes longer, we would have won it." There are many sports that end not by a clock, but rather by a pre-determined number of intervals. Tennis, bowling, and baseball aren't limited to a specific period of time. However, the interval method is just a different way of measuring time. Once the prescribed number of intervals is over the winner is declared. Again, the excuse is built-in, "We were better the whole game. If it had ended one inning (set or frame, whatever the case my be) earlier, we would have won it." There are even sports that end with a judge's decision. Boxing, gymnastics, and figure skating aren't dependant on a clock or a number of intervals, but rather by a decision from a panel of experts. Of course, the loser will surely claim some bias on the part of the Soviet judges. In any case, nobody is resigning. The Miami Heat didn't resign the NBA Finals after dropping game 2 with a hideous 15-point 4th quarter blunder. The Vancouver Canucks didn't resign after the 2nd adjournment in a clearly losing position. Almost all sports have to play it out until the bitter end. Chess is nobler. It offers the option of resignation. There is no need for garbage time where your seconds sub in to get some moves on their stat sheet in a totally lost position. However, being the only sport, in its purest form, where the object is to get your opponent to admit failure doesn't work well with ignoble human beings. After all, who likes to admit they failed. Perhaps chess could gain some of the popularity of the other sports if it removed the gracious concession. There is a lot of skill in knowing when to give up the fight, and no one is teaching the art of resignation. In fact, I have heard there are coaches who won't even let their students resign. Chess, in its practical mode, has already had to adopt the shortcomings from the other sports. Tournament games end because of a clock. Champion matches have a pre-determined number of intervals. There are even some games that are adjudicated by an arbiter. So, why not go all the way and move the game of chess totally into the land of bitter-enders? If you are not sure how to end your chess battle in a spiteful fashion, I have put together a list of the different ways to lose. Since chess is a war game, I have taken my inspiration from some famous battles throughout history. Check over the list and see which type of bitter-ender suites your personality the best. Bear in mind that you are more than welcome to choose multiple styles to employ in various situations. 1. The Bridge Builders (The Helpmate) - In the Battle of Pasir Panjang (February 13, 1942), 1,400 Allied forces faced off against 13,000 Japanese troops in an attempt to save Singapore. The Japanese suffered a disproportionately high number of casualties because of these men's bravery. However, the prisoners of war were pressed into service to build a bridge over the river Kwai, which they did diligently, helping the Japanese to finish a bridge they were struggling to complete. So, when your chess game has gone horribly wrong and you have lost the will to fight, don't resign. Give your opponent as much help as you can. Stop defending the king, move him out in the open, and make the mate as obvious as possible. If you got mated accidentally, be sure to tell your opponent, "I let you win." 2. This Is Sparta! (The Basic Mate) - At the Last Stand at Thermopylae (circa 480 BC), 300 Spartans took on an army of 6,000 Persians. When a Persian envoy boasted, "Our arrows will blot out the Sun." The Spartans replied, "So much the better, for then we shall fight in the shade!" And they all fought to the death. So, if the writing is on the wall, don't resign. Give away all your pieces. Throw one piece after another at him until everything is gone and you have to be mated with just a king on the board. 3. Samurai (Stalemate) - In the Battle of Shiroyama (September 24, 1877), the Emperor was pushing aside the samurai way of life for modern weaponry. However, the samurai commander would not surrender and committed ritual suicide to avoid the dishonor of capture. So, you can take the Spartan way out or you can be a bit more sneaky and take away any honor from your opponent's crushing position by holding onto that rook until it gains super powers. 4. Swiss Cheese (Flag When Winning) - At the Last Stand of the Swiss Guard (May 6, 1527), 189 Guardsmen held off 20,000 troops on the steps of St. Peter's Basilica to allow Pope Clement VII to escape. While the troops of the Holy Roman Empire under Emperor Charles V sacked the city and wiped out all but 42 of the Swiss Guard, it was a hollow victory as the Pope got away. So, if you ever have a winning position, but lose on time, this style is for you. The key is the post-mortem where you can poke holes in your opponent's attack and slice up his defense. 5. The Legion (Flag When Losing) - In Battle of Camaron (April 30, 1863), the French Foreign Legion began the legend, "The Legion dies, it does not surrender," when a handful of Legionnaires faced Mexican forces. The bullets ran out and only six men remained. Still they refused to surrender and fixed their bayonets. The final three were asked to surrender, but they demanded their own conditions. And got them. So, if your opponent asks you to resign, don't settle for his offer. Go out on your own terms. Just let that clock run. This style is especially effective for online chess. Your opponent won't be able to tell that you aren't just thinking, but rather have gone to the kitchen to get a soda. 6. Nuts! (Disconnect) - At the Siege of Bastogne (December 19, 1944 - December 26, 1944), 15 Divisions of Germans surrounded the 101st Airborne Division with meager supplies. When asked to surrender, Captain McAuliffe replied, "Nuts!" Of course, this style only applies to online chess, but if you are playing that bad, it is better to just type "Nuts!" and get back to real life. 7. Remember The Alamo! (Resign When Mating) - In the Battle of the Alamo (February 23, 1936 to March 6, 1836) 182 poorly armed Texans held off Santa Anna and 2000 Mexican troops for 12 days. Only the women and children were spared. So, if you are not quite ready to abandon resignation altogether, here is a stepping-stone for you, but you can't resign until it is almost completely over. Mate in one is best; mate in two is borderline. 8. Tin Can Sailors (Resign When Winning) - At the Battle Off Samar (October 25, 1944), a Japanese decoy fleet lured Admiral William Halsey, Jr. and the U.S. Third Fleet away from the Japanese navy, leaving only a tiny force of tiny ships to guard the rear. Despite having one of the greatest military mismatches in naval history, Vice Admiral Takeo Kurita was confused by the tiny force's bold defense (also known as "The Last Stand of the Tin Can Sailors) and withdrew. While this style includes resigning, it perverts the true nature of a resignation so much that it would have to be considered mind games. It is comparable to Bobby Fischer forfeiting game 2 of the World Championship match with Boris Spassky. 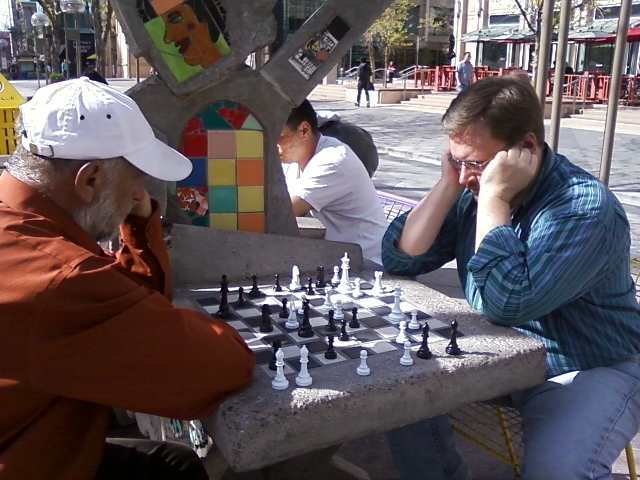 For example, I played chess at the 16th Street Mall in Denver for the first time this year. It was a lot of fun, but the guy I played left me confused. He lost every game we played, and when he was finally winning, he resigned. I don't remember his name, but he looked a lot like GM Boris Gulko. My tiny ships are easily sunk with 22…cxd4! Was he confused by some imaginary forces he thought I had in reserve? Or was this really the Grandmaster using some kind of mind game. I couldn't help wondering if he was just trying to get into my head in case we met for the World Championships someday. 1. d4 d5 2. c4 dxc4 3. e4 b5 4. Nc3 c6 5. Nf3 Bb7 6. Be3 a6 7. e5 e6 8. a3 Ne7 9. Bg5 h6 10. Bh4 Qc7 11. Be2 Nd5 12. Ne4 Be7 13. 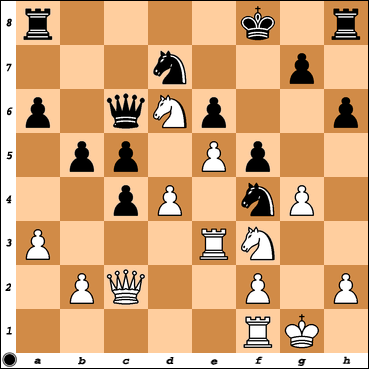 Paul, number 4, Swiss Chess isn't necessarily my most favorite way to stick it to my opponent but is one of my most common ways to lose. That is, in 1-minute speed chess on ICC. However, I would prefer number 3, Samurai, where I don't actually lose, but rob my opponent of a win! That method gives me the most satisfaction (because I am usually losing anyway).